“The Only Reason for Making Honey is So I Can Eat It,” said Pooh. 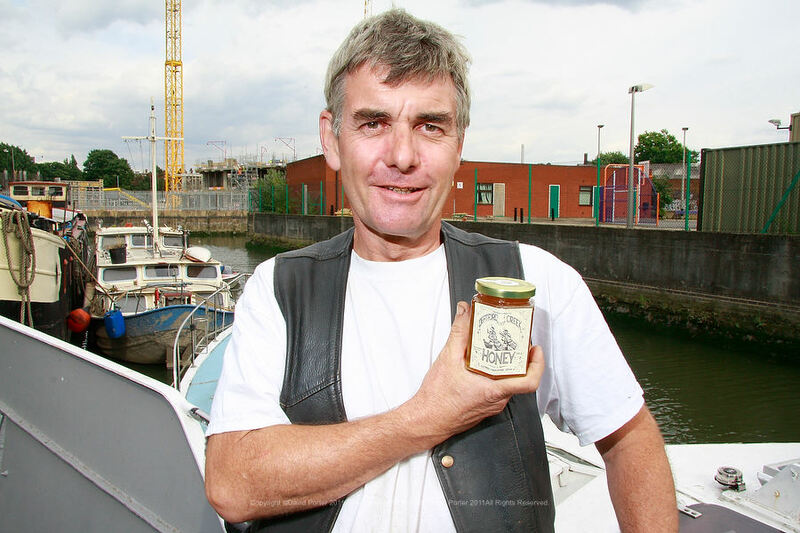 A couple of days ago I heard that the Deptford Deli was closing, very sad, a nice place to sit outside in the summer, and where I bought my supplies of Deptford Creek honey. 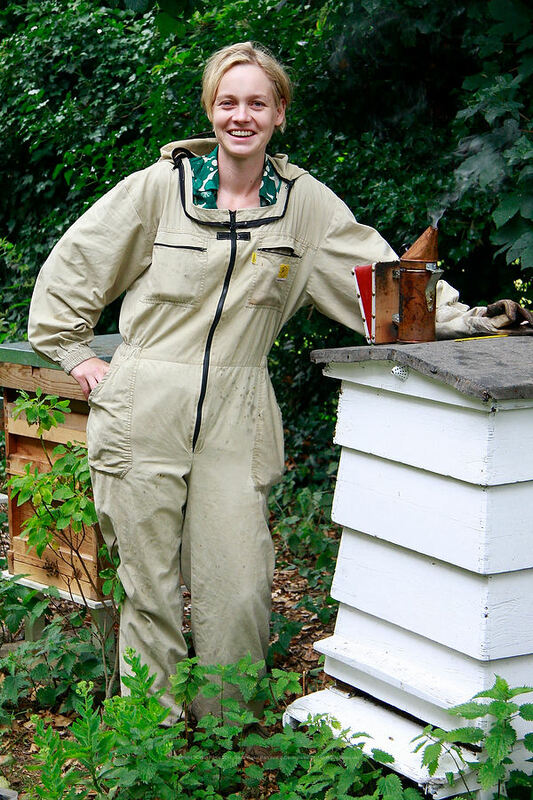 When the talk started of ‘colony collapse disorder’ a couple of years ago, I went in search of local beekeepers. Deptford Creek is the tidal mouth of the Ravensbourne River, where it empties into the Thames. This stretch is dominated by the overhead track of the Docklands Light Railway following the Creek on a curving viaduct. Julian and Jeanie Kingston live on the Creek in the ‘Sabine’, an old boat built for the Kiel Canal in 1895. The Sabine is moored next to a builders yard full of scaffolding planks, bits of old plumbing and an old coach and an ice-cream van. Amongst all this are Julian’s 16 brightly painted hives, and besides bottling the honey Julian makes wax polish, and “pretty blinding Mead”. This year supplies are limited, most of Julian’s hives wiped-out by an unfortunate leak from a nearby workshop, one of the perils of keeping bees in an urban industrial location. 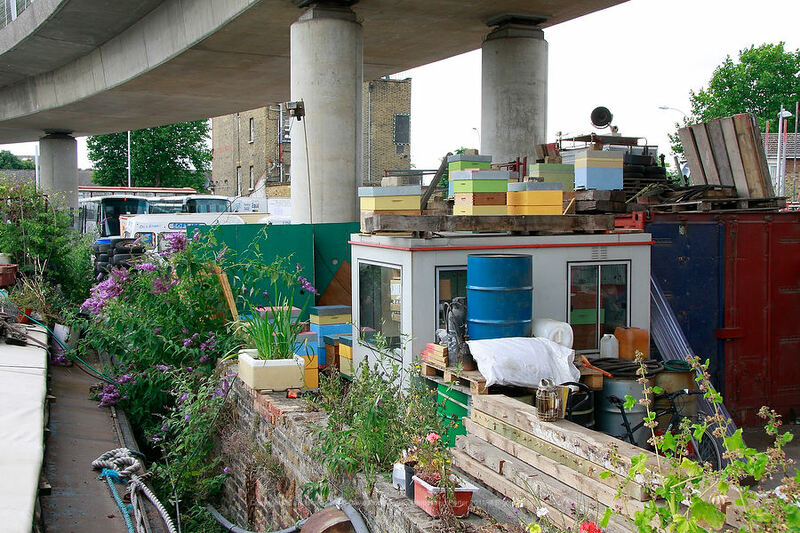 But as Julian rebuilds his colony, Deptford Creek Honey will be available from time to time at the Creekside Centre. 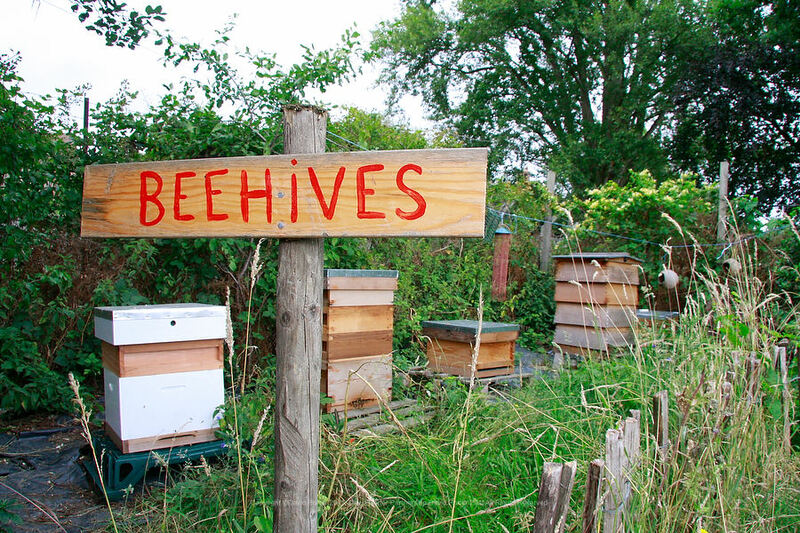 About a mile away in Brockley, Camilla Goddard has hives in a local churchyard, some on allotments in Grove Park, and some in Greenwich Park. 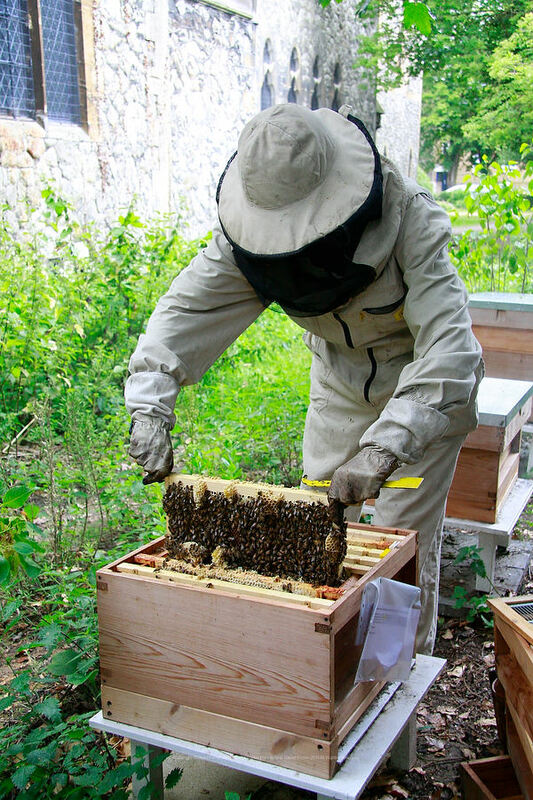 I met her at the churchyard, slightly apprehensive at getting up-close to 6 bee hives. In fact I’d worn dark clothing so as not to upset the bees. Wrong! “Wear dark clothing and bees think you’re a possible threat, a rival swarm,” warned Camilla. But as it turned out, the bees were friendly, bumping into us and hovering around as Camilla wielded her smoke pot. Both Camilla and Julian learned bee-keeping from books, in Camilla’s case “Bees at the Bottom of the Garden” by Alan Campion. We drove to the allotments at Grove Park where I met some very friendly growers. “When I met my first swarm, I ran into my shed,” said one, but now they’re enthusiastic about the hives. Back at Camilla’s flat, in the garden she scraped the honey from the frames. 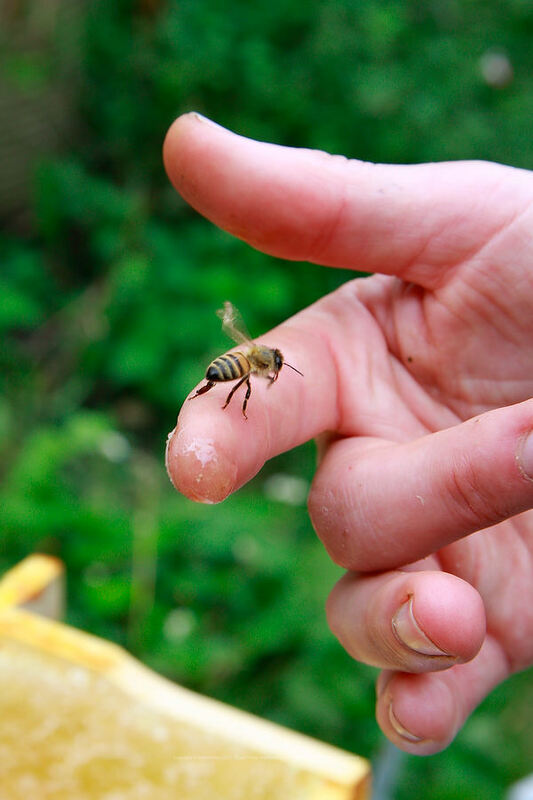 “There’s a lot of ignorance and a lot of fear about bees,” she said, and dipped her finger into the honey. 4 – 6 oysters per person, either shuck them yourself, or ask your fishmonger to open them, but keep the shells. First make the dressing by pouring the cider and vinegar into a small pan, heat to the boil and bubble away till the volume is reduced by two-thirds. Then add the honey, whisking at the same time, and the crushed pepper. Remove from the heat, add the lime juice and put to one side. Mix the batter ingredients together in a large bowl, till it resembles double cream. 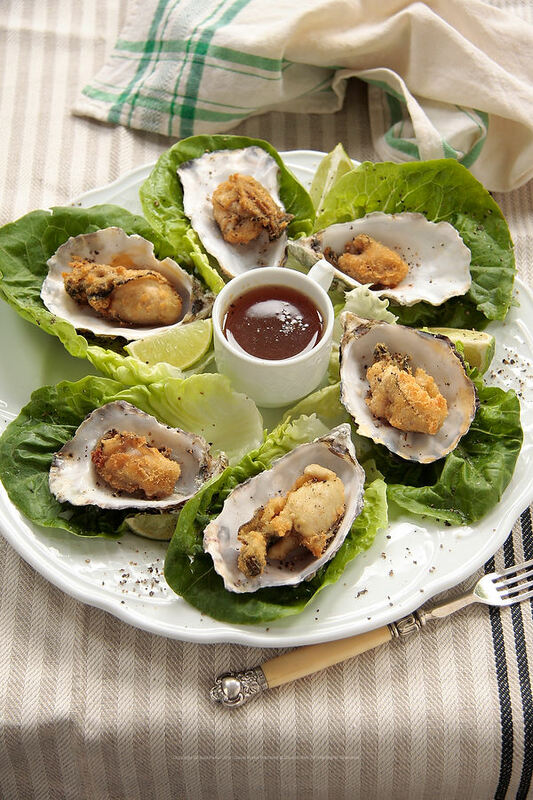 Heat the oil in a deep-fat fryer, or a deep frying pan, to 190C, then dust the oysters in the seasoned flour and dredge them in the batter. Shake off any excess and using a slotted spoon lower them into the oil. Do 4 – 6 at a time, lowering the heat slightly. Let them fry till they are golden, less than 2 minutes. Then remove and drain on kitchen paper while you fry the rest. Serve with the dressing, more pepper and a few salad leaves. This entry was posted on Wednesday, June 22nd, 2011 at 20:08	and tagged with beehives, beekeeper, bees, Brockley, churchyard, Deptford, food, fresh, hives, Honey, local, pudding, recipe and posted in Deptford, pudding, recipe, food, London, English, Food, Honey, Local, Pudding, Recipe. You can follow any responses to this entry through the RSS 2.0 feed.